Compact 45’ x 11’ x 11’ spacious size allows batting practice to be thrown comfortably. Also, great for Short Toss, Soft Toss, or Tee Drills. (6) 1.5 inch powder coated uprights, (3) crossbars cables, (12) vision-enhanced coated guy-wires, (6) cable hangers, (16) steel ground stakes, (3) turnbuckles, (36) snap rings and (12) eyebolts. #27 Twisted Knotted Black Polyethylene Netting—Perfect for Backyard use.This netting is hung on the square and is designed specifically for baseball and softball use. Knotted nets have a higher overall strength and durability rating making them superior for direct impact sports like baseball and softball. Twisted netting has a higher abrasion resistance than braided, because twisted has less surface area than braided. This allows the balls to slide and spin off of the surface. Polyethylene netting doesn’t absorb water—perfect for wet or humid hot climates­—This is the best protection to prevent rotting. No permanent construction required. 2 person setup in less than 1 hr. Powder coated grey steel tubing hold up very well to strong sun or rain, looks great for years. JUGS Hitter’s Door for easy in-and-out access. Vision enhanced coated guy-wires and doubled staked at corners for added safety and durability. Quickly dismantles—simply unhook turnbuckles to lower entire cage to the ground. 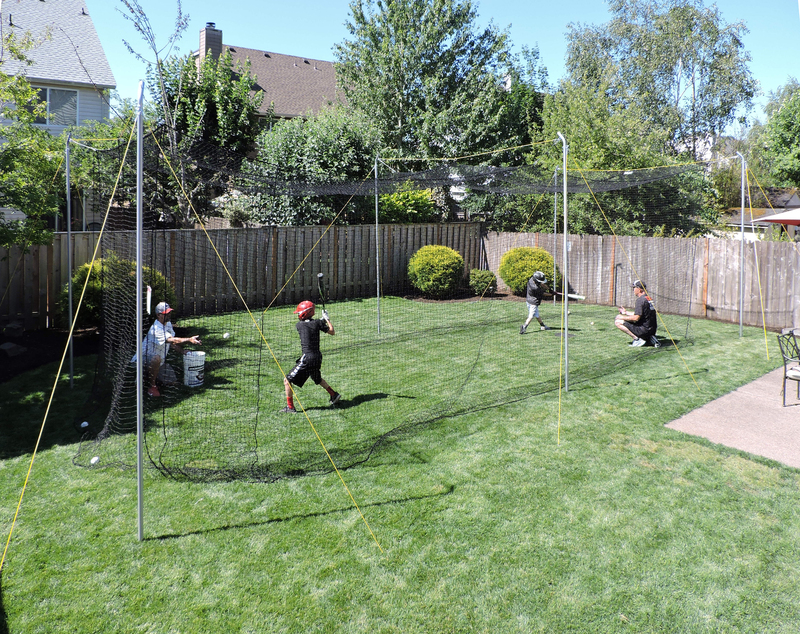 Perfect for backyards, or small hitting area. 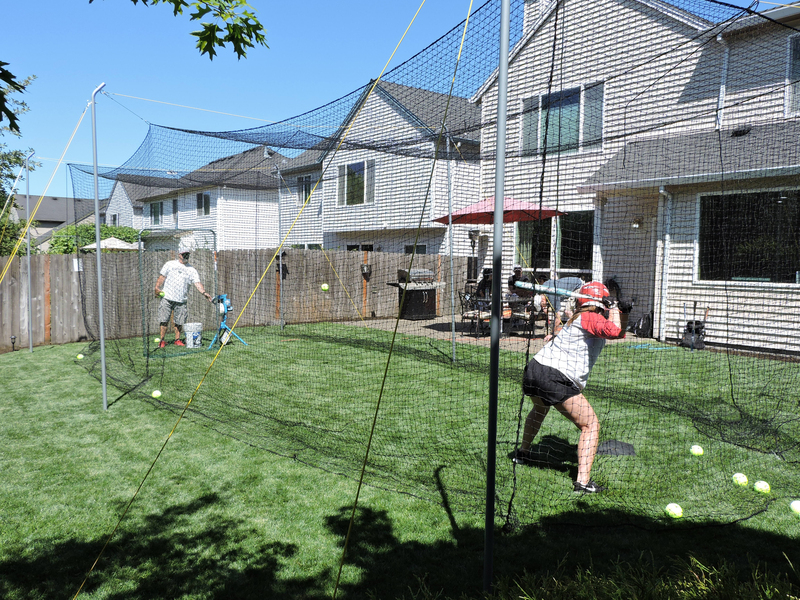 Purchase the NEW Hit at Home® Backyard Batting Cage and the JUGS PS50 Baseball and Softball Pitching Machine, TOGETHER in the NEW money saving Hit at Home Backyard Package!